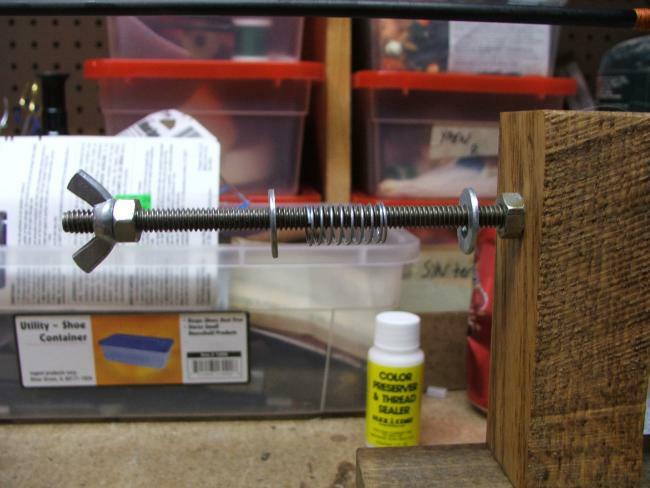 I have checked with all of the hardware and box hardware stores in my area trying to find spring steel for use as tensioner with my rod wrapper. All I get is blank stares and "don't have such an animal" from all. That being the case, does anyone have a source I might be able to order round spring steel from? Also, I've heard 1/4" round spring steel stock will work for the tensioner. Is this correct, or would another size work better? Thanks for any suggestions you can come up with. btw you use round spring steel in a 1/4 inch round your not going to be able to bend it i would be thinging like a 1/16 or 2/16 of a inch max mite even be smaller should be all you need. 1/4" diameter spring steel is going to be very stiff. I would guess you'd want something much smaller, like 1/8" or less. Go to www.mcmaster.com and look up "music wire". That should help you find what you need. Somewhere I saw a photo of the tensioner you are talking about. they used a graphite tip section, and tip top. Give a man a fish, and he eats for one day. Give a fish a man, and he eats for weeks!!! I just used an old tip section from a fly rod. Try a music store. Piano wire or guitar strings might fit the bill. Most hobby stores sell piano wire. Thanks everyone for the suggestions. I am currently using a rod tip, but it is so stiff, in spite of trying to control the tension with one of the dial in tension devices, the thread is going onto the rod very tightly. My first wrapper used the spring idea for tensioning, but it kept tightening up as I wrapped and was hard to control. The piano wire idea is the best one I've seen, and the website you gave me Mark looks like an excellent source of materials. Now all I need to do is figure out what's going to be most appropriate size. A trip to the local music store should be enlightening. Small Parts Inc used to carry spring wire, and I think they still do! I've heard of guys using a piece of a clothes hanger, or a welding rod, with a tiptop glued in place. Might be worth a try. 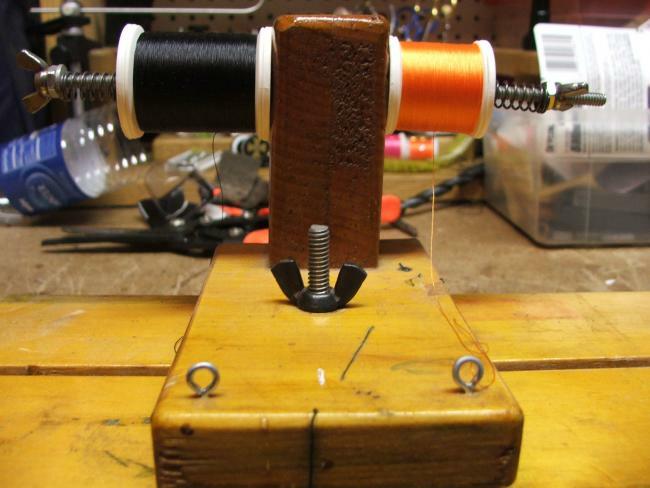 I don't use a rod-wrapping cradle -- just a spool tensioner while holding the rod in my hands. The hands provide the needed tension. Check with a local machine shop or tool & die shop. They should be able to help you. Also, some hardware store or building supply houses as Lowe's carry specialty washers that would be made of a spring steel material. Most industrial supply houses carry spring steel items. Me, I just use a 1/4-20 bolt through a piece of wood, washers on either side of the spool, a compression spring, hex nut, and a wing nut as a jam nut. I can set the tension for any type of thread. Remember: When you feed the cat, don't lick the spoon! Anybody tried the steel springs from and old rake? Just a suggestion. You can pick up a piece of an elecricians snake. They are spring like and you can cut to the length you need. Home Depot or Lowes has small ones. I'm using spring steel piano wire that is .039" in diameter with good luck. I picked it up in 18" lengths from Small Parts Inc. You can google them up and find a world of things to look at. "Our best is none too good"!